Complex erosion by wind and water causes serious harm in arid and semi-arid regions. The interaction mechanisms between water erosion and wind erosion is the key to further our understanding of the complex erosion. Therefore, in-depth understandings of the influences of water erosion on wind erosion is needed. This research used a wind tunnel and two rainfall simulators to investigate the influences of water erosion on succeeding wind erosion. The wind erosion measurements before and after water erosion were run on semi-fixed aeolian sandy soil configured with three slopes (5°, 10° and 15°), six wind speeds (0, 9, 11, 13, 15 and 20 m/s), and five rainfall intensities (0, 30, 45, 60 and 75 mm/h). Results showed that water erosion generally restrained the succeeding wind erosion. At a same slope, the restraining effects decreased as rainfall intensity increased, which decreased from 70.63% to 50.20% with rainfall intensity increased from 30 to 75 mm/h. Rills shaped by water erosion could weaken the restraining effects at wind speed exceeding 15 m/s mainly by cutting through the fine grain layer, exposing the sand layer prone to wind erosion to airflow. In addition, the restraining effects varied greatly among different soil types. The restraining effects of rainfall on the succeeding wind erosion depend on the formation of a coarsening layer with a crust and a compact fine grain layer after rainfall. 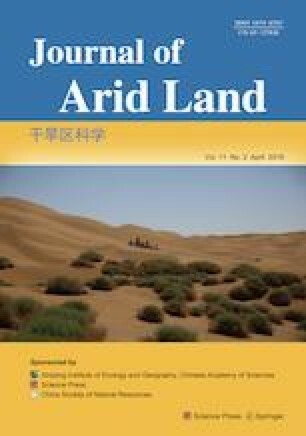 The findings can deepen the understanding of the complex erosion and provide scientific basis for regional soil and water conservation in arid and semi-arid regions. This research was supported by the National Natural Science Foundation of China (41271286) and the Innovative Research Group Project of the National Natural Science Foundation (41621061).